The Morgan-Phillips family of Brynlloi and Llwynhendy. This picture was taken at Brynlloi, Glanamman. 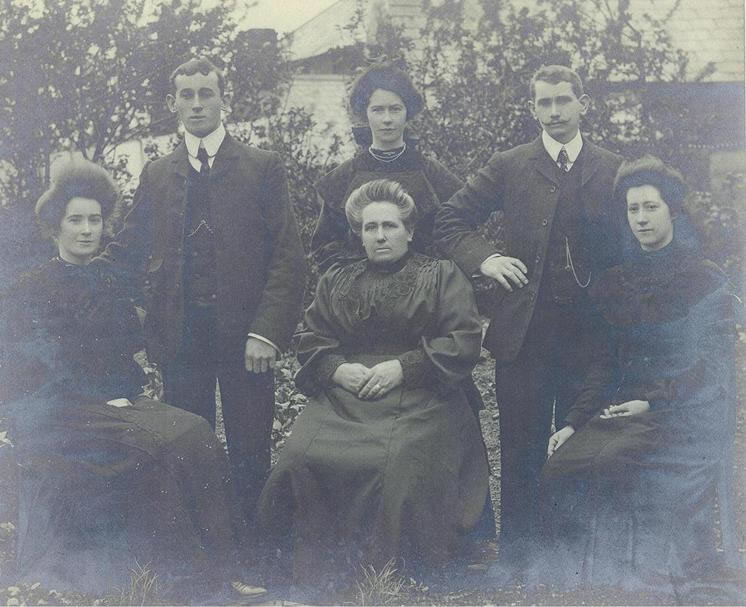 Gwenllian Morgan Phillips (centre), was born at Brynlloi Farm, Glanamman. She was the daughter of John and Rachel Morgan and married a man named Noah Phillip (became Phillips later). Like their Mother, John and his sister, Rachel, were also born at Brynlloi. Gwenllian and Noah eventually moved to Cwm Carn Howell, Llwynhendy, where Noah worked at Bynea Colliery as a stationary engine driver. Two of Gwenllian's younger siblings emigrated to the U.S.A. Her sister, Margaret Morgan Thomas, became the mother of Congressman, William Aubrey Thomas, who served in Teddy Roosevelt's government. Gwenllian's brother, John Thomas Morgan, was also born at Brynlloi. He left Glanamman when he was only 19 years old and sailed from Liverpool to New York. He eventually became the owner of a bank in California. Thanks to Janet Cross (U.K.) and John Fouts (U.S.A.), for this contribution.